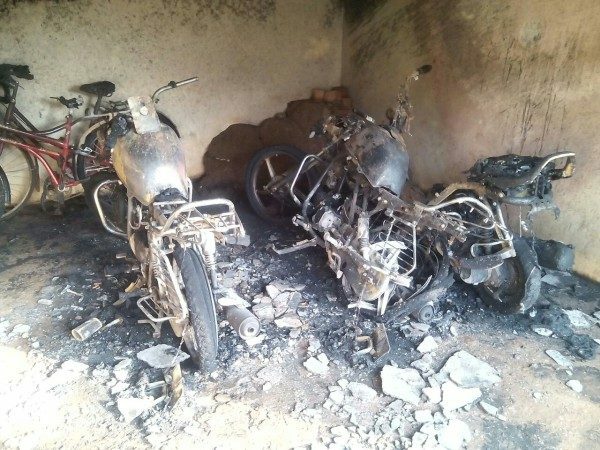 Three bikes were completely gutted in the fire that might have caused due to the lighting of lighter while a group of teens were trying to rob petrol from the bikes last night in Samruddhi colony under Tilakwadi Police station limits. Sources said about 3-4 young teens were trying to rob petrol from the parked bikes when one of them lighted a lighter to see if the bottle is full, and this caused the fire and all the 3 bikes parked were gutted down. The incident came to light where the neighbors saw some fire and shouted at about 1 AM and by the time they could douse the fire all the bikes were gutted.